The Maasai people are one culture group that lives in the shadow of Mount Kilimanjaro in Africa. Their reserves span the borders of Kenya and Tanzania in the Great Rift Valley, surrounded by Mt. Kilimanjaro, Mt. Meru, and Mt. Lengai. The word Maasai means "the speaker of the language Maa." Cattle are the basis of Maasai social and monetary economy. In addition to being the main food staple, cows are at the center of Maasai cosmology, creation history, and clan systems. The Maasai are nomadic, traveling to the best grasslands in order to graze their cattle. Cows are rarely slaughtered for meat, but their milk is part of a Maasai's daily diet. The Maasai culture has been impacted by colonization by the British in the 1900s and the globalization and tourist industry of current times. Their traditional grazing and hunting areas have vastly shrunk over the past 200 years, but in comparison to many other African tribes, they have been able to hold close to their established way of life as nomadic cattle herders. "I remember from my own experience as a warrior how self-confidence takes over the whole being, along with pride and a feeling of ease, as if you yourself and all those around you were thinking, 'everything will be allright as long as the warriors are here.' We were supposed to be brave, brilliant, great lovers, fearless, athletic, arrogant, wise, and above all concerned with the well-being of our comrades and of the Maasai community as a whole." A Maasai warrior is rarely seen without a spear and shield. Spears are a warrior's most precious possession and are used for defending herds and the community against predators. Spears are used as walking sticks and staffs, most commonly seen thrust in the ground by the warrior's side. The metal is kept rust-free by polishing it with animal fat. Wood separates the leaf-shaped blade from the sharpened end. Dark ebony wood denotes a senior warrior, where lighter wood indicates a junior. The shield is used for defense. It is made of water buffalo hide, and is nearly impenetrable. 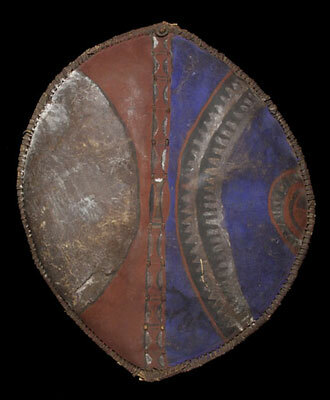 The paint on this shield is a mixture of natural and commercial pigments.